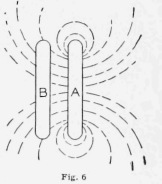 If two coils of wire be placed parallel to each other as shown in Fig. 6, and a current be passed through the winding of one of them, say A, a part of the magnetic lines of force created by this current will pass through the other coil B. These lines of magnetic force must cut across the turns of wire of the coil in which there is no current as the magnetic field is being created, and as a result there will be an electrical pressure produced in the winding of the coil carrying no current. When the current in coil A is discontinued, the magnetic field created by this current is destroyed or it contracts to zero, and the magnetic lines again cut the various turns composing the winding of coil B. The direction in which the magnetic lines of force and the winding of coil B move with respect to each other is just the reverse, when the current in the winding of coil A is increasing, to what it is when the current in the winding of the coil A is decreasing. Any change in the value of the current in the winding of coil A will result in a change in the number of magnetic lines of force linked with the winding of the coil B, and as a result of this change in the number of lines linked with the winding of coil B there will be an induced electrical pressure set up in coil B. The direction of this induced electrical pressure will depend upon whether the current in the winding of coil A is increasing or decreasing in value. When the current in the winding of coil A is increasing in value, the electrical pressure induced in the winding of coil B will be in such a direction that the current produced by this induced electrical pressure will pass around the winding of coil B in the opposite direction to that in which the current passes around the winding of coil A. Or the current produced by the induced electrical pressure tends to produce a magnetic field opposite in direction to the one created by the current in the winding of coil A. When the current in the winding of A is decreasing in value, the induced pressure in the winding of the coil B is just the reverse of what it was in the previous case and the current produced by this induced pressure passes around the winding o f the coil B in the same direction a s the current passes around the winding o f coil A. The current produced by the induced electrical pressure aids the current in the winding of coil A in producing a magnetic field. In general the current resulting from the induced pressure always passes around the circuit in such a direction as to produce a magnetic effect which will oppose a change in the value of the magnetic field causing the induced electrical pressure. There will be an induced pressure in the winding of coil B, due to a change in the value of the current in the winding of coil A, as long as the coil B remains in the magnetic field of the coil A and its plane is not parallel to magnetic lines; or, in other words, coil B must always be in such a position that some of the magnetic lines created by the current in coil A will pass through the winding of coil B. 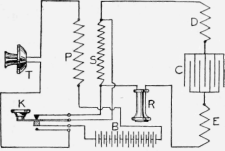 If a telephone transmitter and a battery be connected in series with the winding of coil A, a fluctuating or varying current can be made to pass through the winding by causing the diaphragm of the transmitter to vibrate by speaking into the mouthpiece of the transmitter. This varying current will set up a varying magnetic field and there will be an induced electrical pressure set up in coil B, if it be properly placed with respect to coil A. A receiver connected in series with the winding of coil B will be subjected to the action of a varying current due to the induced electrical pressure in the winding of coil B and as a result, the diaphragm of the receiver will vibrate in unison with that of the transmitter, and speech can thus be transmitted. 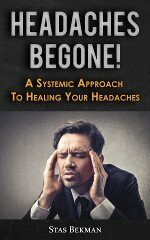 The connection just described should be somewhat modified and a little more equipment used in order to give the best results. Figure 7 shows the complete sending and receiving equipment, a complete outfit of this kind being required for each station. The transmitter T and the receiver R may be an ordinary local battery transmitter and receiver, although a high-resistance receiver will give better results. The induction coil with the windings, marked P and S, may be any commercial type of induction coil as used in a magneto telephone instrument, but a coil with a high-wound secondary will give better results. The push button K is to be used in closing the transmitter circuit when the set is being used for transmitting, the key being depressed, and for shorting out the high resistance secondary winding when the set is used in receiving, the key being in the normal position. Ten dry cells should be connected in series and used to supply current to the transmitter circuit, as shown by B in the figure. The receiver R, secondary winding of the induction coil S, and the winding of coil A used in transmitting and receiving the magnetic effects, are all connected in series. The winding of the coil A consists of two parts, D and E, as shown in the figure, with two of their ends connected together by means of a condenser, C, having a capacity of about 2 micro-farads. Each of these parts should consist of about 200 turns of No. 22 gauge silk-covered copper wire, wound on an ordinary bicycle rim. The inside end of one winding should be connected to the outside of the other by means of the condenser, the two coils being wound in the same direction. The condenser C can be procured at a small cost from almost any telephone company. To talk, two of the instruments are placed 25 or 30 ft. apart, and they may be placed in different rooms as walls and other ordinary obstructions that do not interfere with the production of the magnetic field about the transmitting coil, have no effect upon the operation. Pressing the button K at the transmitting station, closes the transmitter circuit and removes the shunt from about the secondary winding of the induction. Any vibration of the transmitter will cause a varying current to pass through the primary winding P, which in turn induces an electrical pressure in the secondary winding S, and this pressure causes a varying current to pass through the coil A. The varying current in the winding of the coil A produces a varying magnetic field which acts upon the receiving coil, inducing an electrical pressure in it and producing a current through the receiver at the receiving station. A filing coherer, adapted to close a local relay circuit and ring an ordinary bell, may be used with the sets just described for signaling between stations.